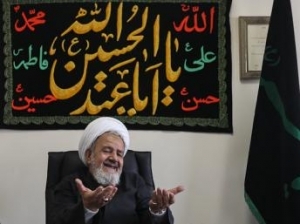 Hojatoleslam Ali Saeedi, Khamenei’s representative to the IRGC, said in Tehran that it is the “inherent duty” of IRGC to ensure a “reasonable and logical engineering” of the forthcoming presidential election. “The IRGC does not directly participate in the elections. It only sets the general framework and guidelines (for the elections),” Saidi said. Meanwhile, Supreme Leader Ayatollah Ali Khamenei warned Iranians the “criticizing the electoral process will help enemies.” Iranians go to the polls in June to elect a successor to President Mahmoud Ahmadinejad. So, is there a problem? Won't this year be a democratically styled election, as opposed to previous years? You know what they can do with their "elections"? That's right you guessed it. who could you trust more than a senile bunch of religious fundamentalist bigots and fools to oversee a " reasonable and logical engineering"? Soon total mind control will be achieved, the minions will remain mushrooms for many many many years!!! Long Live Mr. K & Mr. A, Heros to all Iranians everywhere! Who is Mr.K and Mr.A ? If one must describe the meaning of filth,then these no good vermin are the perfect description. He/She probably means Mr.Khamenei and Mr.Ahmadinejad. Maybe a hero to this poor individual but not to Iranians no matter where they are. Thanks! Just proves how twisted and paranoid the Islamic theocracy is,and falsely claim the majority of people support them. Watch this on YouTube: Hojatoleslam Hossein Ansarian: What will happen to supporters If the regime is changed!